You may have noticed that the exhibit cases on M-level are filled with a new set of books. They come from the George Peabody Library in Mount Vernon, one of the Sheridan Libraries’ three rare book libraries. The exhibit was curated by students in a class held at the Peabody last semester, cross-listed in English and Museums & Society. If you’ve been to the Peabody for a class or to take advantage of its primo quiet study space, you probably know it as a beautiful library. But it’s also a unique research collection with a fascinating history. The Peabody Library began life in 1857 as the library of the Peabody Institute, an athenaeum-like cultural institution founded by the businessman and philanthropist George Peabody. Although he was a wealthy financier at the time of his bequest, Peabody never forgot his days as a tradesman in Baltimore in the 1810s and ’20s, when it was difficult to gain access to music, art and ideas. His Institute had four components: the library, the conservatory (still in existence of course! ), an art collection (much of which was eventually absorbed by local museums) and a lecture series (which leant impetus to the founding of Johns Hopkins). As a free, non-circulating public library—Baltimore’s first public library—the Peabody helped Baltimoreans educate themselves. 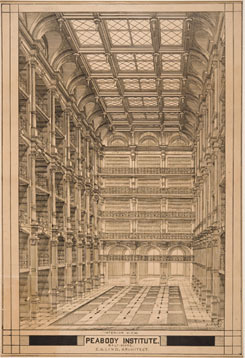 The library also served the faculty and students of the new JHU when it opened its doors in 1876. The Peabody’s collections (documented in one of the first printed library catalogs) provide unusual insight into what 19th-century readers cared about: what casual readers read for pleasure and self-improvement, what scholars consulted in their research and what librarians thought was important to preserve for future generations. The building tells us about Victorian architectural aesthetics and life in 19th-century Baltimore. This past spring, students in “Reading Culture in the 19th-Century Library” met in the library to study it as a physical space and a collection in order to investigate 19th-century reading practices and values. For their final project, students created collections of books from the Peabody reflecting different facets of its holdings. From the charm of international fairy tales to the call of the American West, from the power of religion to the allure of ancient Rome, the patterns their collections document shed new light on 19th-century reading. Reading the Peabody presents samples from the students’ collections, bringing us their discoveries in and about a great 19th-century library. It’s easy for you to carry out your own research at the Peabody: search the rare books collection and limit your results to the Peabody; tell us what you’d like to look at; then take the shuttle down to Mount Vernon to read your books in situ. Instructors: let us know if you’d like to hold a rare books class in the Peabody or at another location. Visit the Peabody Library at the Baltimore Book Festival!